There's always huge demand for Le Creuset cookware and especially over the spring holidays when entertaining friends and family becomes a full-time pursuit. The trouble is – and there's no getting away from this – Le Creuset cookware isn't the cheapest. But, of course, you are paying for fantastic quality. The good news is that there are some great Le Creuset sales running at the moment, so you can pick up some of this premium cookware at a tidy saving in time for Easter. The Le Creuset winter sale is still underway (it must end soon, surely!) and there are a few more great deals there although they seem to be running out fast. We've listed our favourites below. You'll find more deals in Le Creuset UK's Offers section. The range on offer varies and right now there are some cast iron skillets and casserole dishes at clearance prices as well as cut price frying pans, saucepans, stoneware and more. Onto the Le Creuset sale at John Lewis. The retailer has offered some really nice deals in the past. Right now the store is just price matching on items such as casserole dishes and skillets, but still worth a browse. The Le Creuset sale at Debenhams comes and goes, and right now it's on. The Debenhams Le Creuset sale page has discounts of 20% on cast iron skillets (square ones and round ones), stoneware oven dishes in a variety of colours, cake tins, saucepan sets, oven gloves and more as part of the Debenhams Blue Cross sale. We don't know when this particular sale will end, so do take a look before it does. 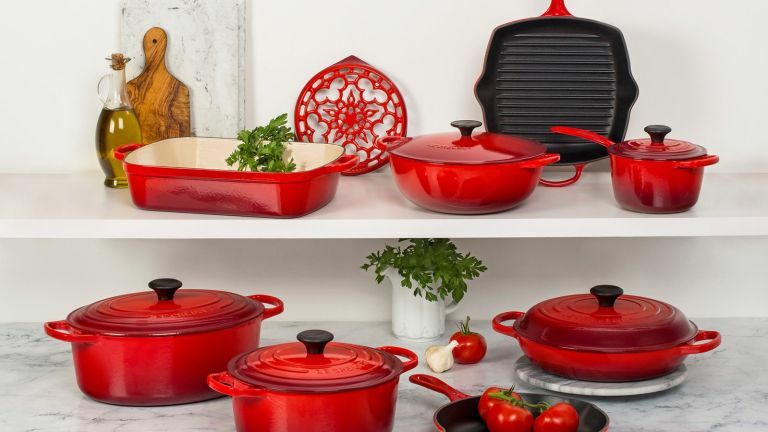 Over at Ecookshop there's a Le Creuset clearance sale going on with a handful of Le Creuset items reduced, including a cast iron starter set (that classic skillet and casserole dish combo) at 50% off, wine cubes for 50% off and baking dishes up to 30% off. Harts of Stur is offering a (very small) handful of clearance items on its clearance deals page and The Hut is running 3 for £30 on mugs and 2 for £25 on soup bowls. Finally, take look at Amazon UK's Le Creuset discount page where the deals change frequently but lots of items are discounted by 20% or more off their RRP. Right now, you can get the iconic Le Creuset skillet in a range of colours, some with tasty discounts. If you're in the US, then you should definitely check out the Specials on the Le Creuset US site. Right now there are some great savings to be had on a range of pan and bakeware sets, so you could save hundreds of dollars as your upgrade your pots and pans. There's also 20% off dinnerware and more promotions such as free shipping and a metal bakeware sale. There are some good deals on Amazon US, too. We're not sure how long any of these deals will last, so if you're planning to entertain friends or family and you want to do it in style, you might want to hurry.